Because shapes inhabit finite areas, they have edges. Edges are always active places, where the material, color, dimension/thickness, elevation or texture changes. At edges things can dissolve, penetrate, escape and enter each other—think about cells. They can dive under or soar above each other. Edges slice, border, enclose, separate, divide, surround, protect. If interior shapes pierce other interior shapes or the borders of the piece, they may be interpreted as either having a lack of control or making a bid for freedom. “Second Blossom.” Betty Helen Longhi. 18k/ss bi-metal, sterling, niobium, stick pearl. Photo Michael Cunningham. Photo courtesy of the artist. Edges are where things can change from solid to insubstantial or back—and usually suddenly. (We use the term “on edge” when we’re tense or irritable. Or “edgy” when something is new, pushing the envelope, pushing the edge.) As a result, edges can be exciting or terrifying. Stand on the edge of Grand Canyon and depending on how you feel about heights or space, you’ll see what I mean. As we’ve already seen, edges are not seen alone but in context with other shapes. If a transparent or translucent shape overlaps another shape, it can alter the color or the apparent texture of the shape below it. That area of overlapping creates yet another shape, one with its own edges. It’s like looking into a hall of mirrors. The quality of its edge says something about a shape. Edges may be blurred, sharp, soft, rough—do you want to approach or back away? Torn, ragged edges say something different from smooth, worked edges—is it old, worn, experienced or new? Edges stop the eye or, if permeable or fuzzy, let the viewer’s eye roam past. The way shapes interact at their edges can carry meaning. 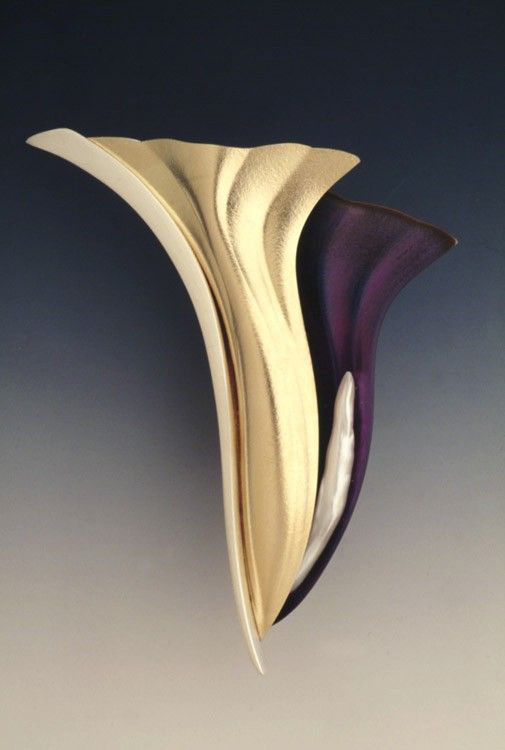 Look at Betty Helen Longhi’s brooch, “Second Blossom.” There is a small change at the edge between the sterling and the gold–some change of dimension, some in color. But there is a much more pronounced change between the gold and the purple anodized niobium. The darkness of the color exaggerates the edge and the apparent depth of the “drop off.” But from that difference in edge springs a pearl–symbolic of new growth. One of the most important shape edges in jewelry is the border of the piece, the place where the jewelry meets the air, clothing, or body. These edges are usually sharp and definite, framing the piece so that everything inside the edge becomes the subject when seen in the larger context of the body’s background. Edges determine where your piece ends, how large it will be. Being clear about which shapes or group of shapes is the subject or focus of a jewelry piece helps you direct the viewer’s attention to where you want it. If the visual weight of the figure (focal point) and the ground (background) are equal—in area, contrast, color, or texture–the eye can’t tell what the “subject” is.